“The garden is a mess” was my only statement one day in 2012. “I hate this space”. I know that the staff hate to hear those words. I was tired of the same planting and the same look for 30 years. Oh it was not that bad, pretty enough but not very complex. A garden filled with trees, shrubs and flowers may be delightful to look at, or stroll though, but it need something more. 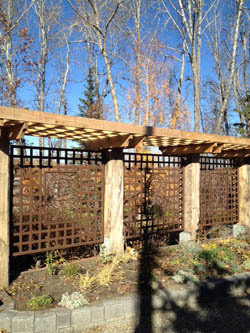 Arbours, Trellises, pergolas and the like are types of garden architecture that seem to have fallen out of popularity in the recent years. Yet their function in the garden is an important one and deserves a second look. 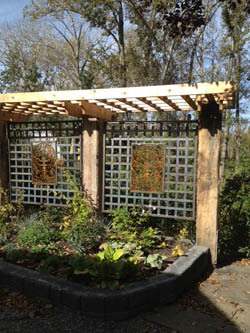 As our home garden spaces get smaller, pergolas can give you a private space without acting as a fence. 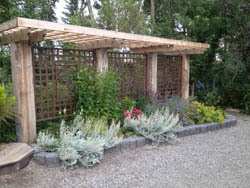 Because a Pergola is a more open and usually more decorative it is often detached from the house, and has a greater potential than a breezeway as a distinctive architectural element in the garden. 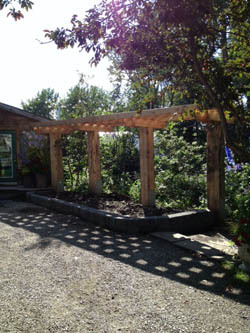 Our Pergola is built to separate out the wild space behind it while maintaining the more tame and manicured public space in front. The metal lattice work in the centre provides just a hint of visual depth while keeping your eye fixed in the main sales area. This garden space worked out better than I had hoped. 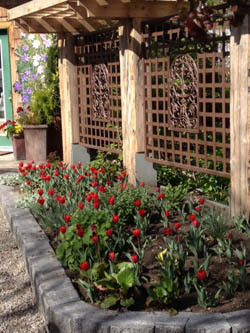 The garden that was once planted with seasonal annuals has changed to a more complex planting of perennials and spring bulbs. 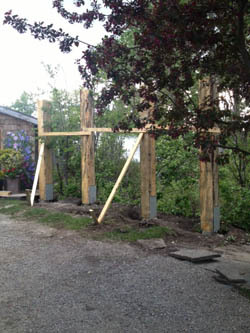 The previously ground level garden bed is now slightly raised which adds a more propertioned equally look to the heavy timber of the pergola.